True Confession: I am a gigantic Charles Dickens fan. I could rightly be called a Dickens fangirl. In addition to loving his work, I also know that he was a hugely influential author in terms of the business of publishing. He was a rock star in his day and is considered the best of the Victorian authors (with good reason). Plus and because of this, almost all of modern publishing owes a great debt to him (royalties, payment per word, advances, copyright protection, serialization of novels, self-publishing… the list goes on, all created or vastly strengthened by Dickens). So, I was excited to see this picture, because he’s a hero of mine, even though I expected a stuffy, arthouse film. It’s nice to be surprised, in all the good ways. This is not an arthouse film. This is not a stuffy film. This is a thoroughly enjoyable movie, with laughs, pathos, excitement, wit, conflict, drama, and a happy ending that’s actually earned. And it proves that Dickens did more than just influence publishing in a big way – he did the same for Christmas. Charles Dickens (Dan Stevens) is having money issues he doesn’t want to share with his friends and family, he’s had a couple of flop books, and needs another hit in order to keep on paying the bills and feeding his growing family. Oh, and he can’t come up with a new idea for anything. But through a series of experiences, some with his friend and agent John Forster (Justin Edwards), some via the family’s new maid Tara (Anna Murphy), some from dealings with his lawyers or publishers, friends and frenemies, and his own family, he gathers inspiration for a Christmas story. Through a series of interesting events, Dickens discovers and creates the character of Scrooge (Christopher Plummer) and from then on, Scrooge hangs out in Dickens’ head, arguing with him, helping him, admonishing him, and generally acting like characters in your head do. And as other characters show up, they hang out, too. Dickens is haunted by his past, and also haunted by his living father, John Dickens (Jonathan Pryce), a charming man who’s busy selling his famous son’s autographs and borrowing money using his son’s name behind said son’s back, while also wasting the money said son gives him on things that don’t necessarily matter. Dickens has a lot of resentment for his parents – incredibly well-deserved – that he has to deal with, all while trying to write a and publish a Christmas book in six weeks – so that it can be out before Christmas (yes, essentially, he also created the Christmas retail season). Does he manage it? Well, we know he does, but it’s how he does, and what goes on while he’s doing it, that matters. 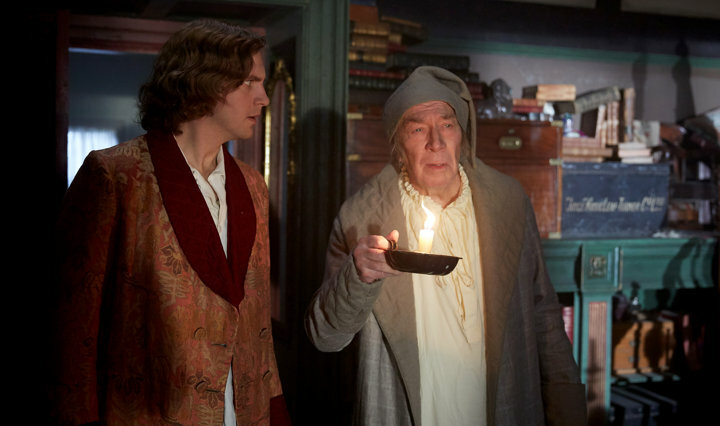 Christopher Plummer (center, left) stars as Ebenezer Scrooge and Dan Stevens (center, right) stars as Charles Dickens in director Bharat Nalluri’s THE MAN WHO INVENTED CHRISTMAS, a Bleecker Street release. At the time Dickens wrote A Christmas Carol, Christmas wasn’t as big a deal as it is now, it was something of a minor holiday. But A Christmas Carol changed all of that. And before you scoff, I’ve done the research (remember, I’m a Dickens fangirl), and this movie was incredibly accurate. There were a few liberties taken, but not all that many, and far less than normal for any kind of biopic. All of the backstory we discover about Dickens and his family is true, as well as his influence on both the Christmas holiday and traditions and, most importantly, charitable giving. A Christmas Carol was directly responsible for a huge increase in charitable giving, and that alone would be enough to call Dickens a reformer. But he was passionate about child labor, how debtors were treated, and treating the “lower classes” as real people, all with good reason – as with most reformers, he was passionate because he’d been there. But all that makes the movie sound “important” when what this movie is, most of all, is fun. It’s entertaining without preaching, exciting without a single cab chase, dramatic without being maudlin, witty without being over the top. The cast is top-rate – all the performances are amazing. I literally can’t call out anyone over anyone else – yes, Stevens and Plummer are great, but so is the rest of the cast, even the child actors. In addition, the characters are three-dimensional, the screenplay excellent, the direction superb, the cinematography, costuming, and sets make you truly feel that you’re in London in the late 1800’s, and the score is perfect without being intrusive. The Man Who Invented Christmas is, like any number of variations on A Christmas Carol, a movie that I’d like to watch over and over again during the Christmas season. It’s a new classic – don’t miss it. The Man Who Invented Christmas tells of the magical journey that led to the creation of Ebenezer Scrooge (Christopher Plummer), Tiny Tim and other classic characters from “A Christmas Carol”. 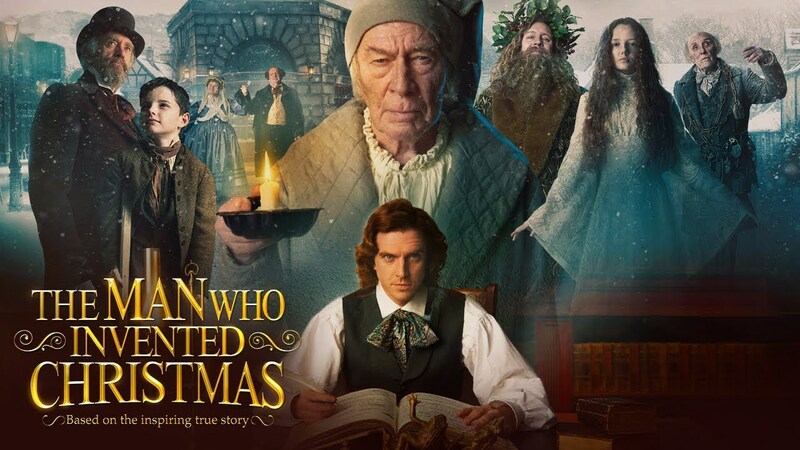 Directed by Bharat Nalluri (MISS PETTIGREW LIVES FOR A DAY), the film shows how Charles Dickens (Dan Stevens) mixed real life inspirations with his vivid imagination to conjure up unforgettable characters and a timeless tale, forever changing the holiday season into the celebration we know today. This is a thoroughly enjoyable movie, with laughs, pathos, excitement, wit, conflict, drama, and a happy ending that’s actually earned. And it proves that Dickens did more than just influence publishing in a big way – he did the same for Christmas.